In clinical studies, 88% of patients received more than one KYBELLA® treatment,7,8 with 59% of patients receiving six KYBELLA® treatments. Everyone has a different level of submental fat and a licensed and trained physician will be able to determine the number of KYBELLA® treatments each patient will need. Multiple injections are given under the chin per treatment and up to 6 treatments can be administered, spaced at least 1 month apart. 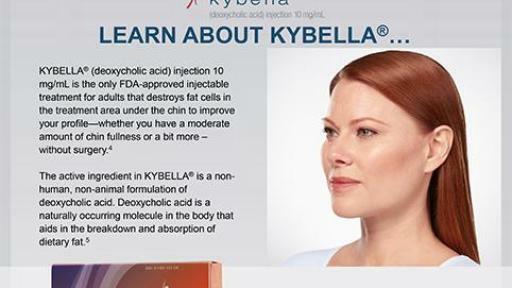 With KYBELLA®, once the desired result is achieved, retreatment is not expected.5 For more information about KYBELLA® or to find a doctor, please visit www.mykybella.com. It is not known if KYBELLA® is safe and effective for use outside of the submental area or in children under the age of 18. Tell your healthcare provider about all the medicines you take, including prescription and over-the counter medicines, vitamins, and herbal supplements. Especially tell your healthcare provider if you take a medicine that prevents the clotting of your blood (antiplatelet or anticoagulant medicine). Please talk to your healthcare provider or visit www.mykybella.com for full Prescribing Information. 1. Allergan, Data on File, Submental Fullness Survey, April 2016. 2. Defatta, Robert, “Liposuction of the Face and Neck”, 2007. 3. Schlessinger, Joel, “Perceptions and Practices in Submental Fat Treatment: A Survey of Physicians and Patients”, SkinMed, Jan/Feb 2013. 5. KYBELLA® Prescribing Information, 2015. 6. Thuangtong R, Bentow J, Knopp K, Mahmood N, David N, Kolodney M. Tissue-Selective Effects of Injected Deoxycholate. American Society for Dermatologic Surgery, Inc. 2010; 36(6):899-908. 7. Data On File, ATX-101-11-22 Clinical Study Report. 8. Data On File, ATX-101-11-23 Clinical Study Report.